Lightning (ライトニング, Raitoningu) is a character in the Yu-Gi-Oh! VRAINS anime. He is one of the six Ignis, representing the LIGHT-Attribute, and he is said to be their leader. He is the primary antagonist of the second season; creating several generations of AI in an attempt to conquer humanity and destroying the Cyberse. Like all Ignis, Lightning is a small digital humanoid being. 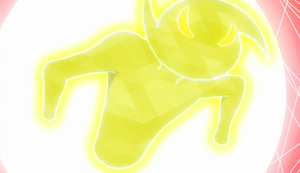 Like other Ignis, Lightning has markings over his yellow body; Lightning has dark yellow star shapes in a similar manner to the Southern Cross at specific locations on his body, a motif that is shared with the members of his organization. He has curved yellow eyes. His body shares the usual shape of the Ignis shared by Ai, Windy, and Flame, but his head is significantly different, shaped in a manner similar to two commas overlapping. According to Ai, Lightning is extremely intelligent, calm, cool, and collected, which makes him perfect as the leader of the Ignis. Lightning and the other Ignis were created by Dr. Kogami to be the saviors of humanity. Alongside his fellow Ignis, Lightning evolved and they created the Cyberse and the Cyberse monsters. Their progress worried Dr. Kogami, who predicted the AI and humanity would become enemies. Despite this, Lightning and the other Ignis continued developing the Cyberse; Lightning's sector becoming a shining metropolis and his tower a golden rectangular skyscraper. Lightning became the leader of the Ignis, with Aqua as his second in command. In Ai's words, the Ignis would never try to harm humanity, and would rather live in their own world. Lightning is trapped by Varis. Varis launched an attack on the Cyberse with three of his "Cracking Dragons". Lightning and the other Ignis were sealed off and could not retaliate, except for Ai. Varis and one "Cracking Dragon" chased Ai, who escaped and severed the connection to Cyberse's location. Windy realized that Ai meant to hide their world, at the price of being unable to return. Just as Ai succeeded and gloated about it, the pursuing "Cracking Dragon" devoured him. Wishing to destroy humans, Lightning created Bohman and used him to destroy Cyberse World in an attempt to rally the other Ignis against humanity. Lightning plays an "Armatos Legio" Deck focused around using cards such as "Armatos Legio Speculata" and "Armatos Colosseum" to Link Summon multiple times within one turn, primarily with a beatdown focus using "Judgment Arrows". He also utilizes his "Armatos Legio Legatus Legionis" to switch his "Armatos Legio" monsters around to grant his Link Monster's additional abilities. During his Duel with Spectre, Lightning used his "Judgment Arrows" along with "Armatos Colosseum" to easily perform an Extra Link. As his Deck is reliant on the Extra Monster Zone, Lightning also includes cards such as "Judgment Sword" to easily deal with if his opponent performs an Extra Link. He also utilized a strategy revolving around co-linking his Link Monsters to gain several effects. ↑ 1.0 1.1 Yu-Gi-Oh! VRAINS episode 43: "The Reveal"
↑ Yu-Gi-Oh! 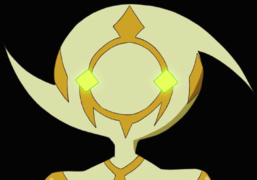 VRAINS episode 1: "Link into the VRAINS"